At its f8 developer event in September, Facebook unveiled one of the biggest reinventions of its user profiles since the site first launched: Timelines. Activate the feature, which is still in beta, and your Facebook profile morphs from what was effectively a feed of your most recent activities to something a lot more personal — you can feature your favorite photos, add widgets showcasing your most-recently listened to songs, and more. And now Loytr, the developer behind the very popular MyPad for Facebook app, has launched an iPad app dedicated to browsing through these revamped profiles. 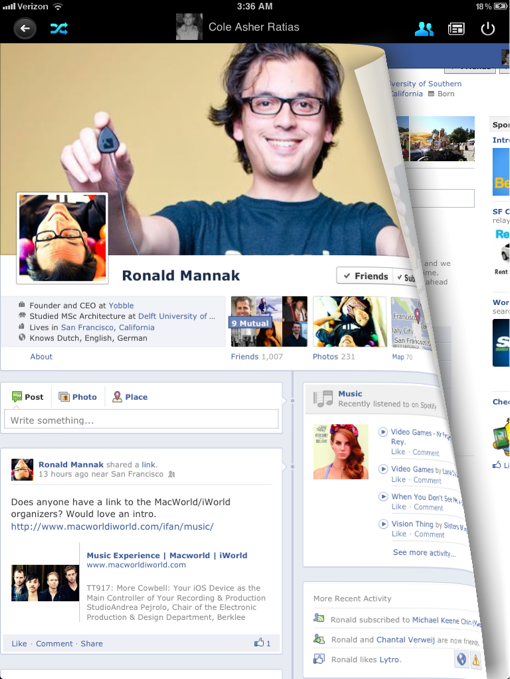 It’s called Timelines for Facebook, and you can download it right here. The free app is basically a frame around Facebook’s website (which is the case for many iOS Facebook apps) but with a couple of twists. The biggest is that the app lets you browse through your friends’ timelines alphabetically or in random order, which is a nice way to casually flick through the site and ‘rediscover’ friends. There are also some nice page transitions between profiles, reminiscent of iBooks. Loytr’s other app, MyPad for Facebook, is one of the most popular third-party Facebook applications on iOS. The company also has another app called GPad in the works that will feature both Twitter and Google+.